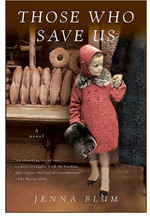 It was a compelling read about the horrors of the Holocaust and the choices one makes to come out alive. I agree with the other reviewer that it is not suitable for teens without discussion. Blum has a gift of storytelling and it was easy to get lost in her words. I'd heard a great deal of talk about this book and was eager to read it. The story itself was moving -- a story of what a mother does during the Holocaust to ensure she and her daughter survive, and how those decisions impact both their lives. There were parts of the book I found to be graphic, and I wasn't prepared for that. A great read, and good for book club discussions, but you should be aware of the graphic nature of certain parts, so I'd not recommend for teens or young adults.